TORONTO, April 3, 2019 /CNW/ - The Digital Society Index 2019: Human Needs in a Digital World, released today by Dentsu Aegis Network, reveals a crisis of confidence in the digital economy as a range of basic, self-fulfilment, psychological and societal needs are failing to be met. Alongside a growing distrust of digital technology, this is prompting consumers to take back control of their digital experience, with significant implications for business. "There are clearly mixed feelings around the omnipresence of technology – both the role it plays in the lives of Canadians and how it is being received," says Jeff Greenspoon, Chief Product Officer, Dentsu Aegis Network Canada. "For our part, the time is now to collectively up the game to deliver insightful and purpose-driven content that can be enjoyed on the audience's own terms. Ultimately, creating an experience that continues to serve brands well and enables a way forward for continued engagement." At the global level, there is a gap between the promise of digital technologies and the actual human impact. 58% of people globally (52% in Canada) think not enough is being done to ensure that digital technology benefits everyone in society, rather than a select few. There is rising concern about the impact of digital on our health and quality of life, as 33% of people believe they have been affected negatively, with young people particularly at risk. And 57% of people are anxious about the pace of change, with that figure rising to over 80% in markets such as Brazil, China and India. Only 45% of people globally (41% in Canada) trust that organisations holding their personal data will protect their privacy. Eight out of ten now say they would stop doing business with an organization that misused their data, representing the most prominent driver of distrust. These concerns go beyond the tech industry: all businesses deploying digital products and services find themselves under a similar level of scrutiny. While digital technologies are transforming how brands serve their customers, a lack of trust and concerns about personal well-being are prompting people to seek a healthier balance of digital media consumption. According to the study, 44% of people have taken steps to reduce the amount of data they share online, 27% have installed ad blocking software (30% of Canadians), 21% have actively limited the amount of time they spend online or on their smartphone (24% of Canadians), and 14% have deactivated a social media account. Consumers most active in taking back control of their online data and time, in ways that will make it harder for brands to engage them, are also those with the highest propensity to use digital products and services (e.g. shop online, use an app to take a taxi or stream music). This is creating a digital paradox for brands - as those most ready to embrace digital marketing and services are also the most likely to push away from them. "Thirty years after the birth of the world wide web, the social and economic impact of digital technology is both extraordinary and on-going. It has powered economic growth, created jobs, lifted millions out of poverty and transformed the way we all live our lives. "But while the innovation, dynamism and growth unleashed by digital technology is the defining economic trend of our time, across the globe, the human impact of that change is both complex and, in some areas, a cause for concern. "Ultimately, digital innovation must serve fundamental human needs. We need to find a more sustainable way to think about the application of data, technology and creativity not just for economic gain, but for the benefit of society at large and for all of us as individuals. "My hope is that this report will inspire a fresh conversation about the digital economy, rooted in a longer-term view and the huge opportunity for brands and businesses to apply the power of technology to enrich people's lives in more meaningful ways." Findings suggest significant progress is required, both globally and in Canada, to better meet people's digital needs. However there are significant variations across countries. 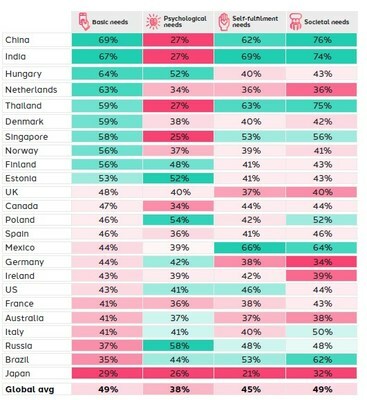 Emerging markets tend to feel their basic needs (digital access and trust in data use) are well addressed, but not their psychological needs (health and well-being). However, people in developed markets are generally positive about their basic and psychological needs, but much less so in respect to self-fulfilment (skills, education and jobs) and societal needs (belief in digital as a force for good). With misuse of personal data the number one driver of distrust, businesses need to compete on openness and transparency around data usage as a positive source of differentiation. By focusing on engagement, not reach, brands can also maximize the value of interactions as consumers increasingly initiate those moments themselves. Drawing on a survey of over 43,000 people, the Index assesses countries' performance across dynamism, inclusion, and trust, to measure how well they are building a digital economy that works for all in society. This year Singapore, the US and China rank as the top digital economies in the world. Canada ranks 12th while the United Kingdom falls to 5th after ranking first in 2018.